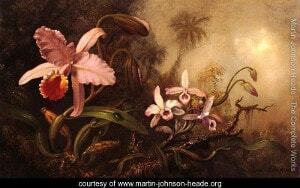 Martin Johnson Heade (August 11, 1819-September 4, 1904) was a prolific American painter known for his salt marsh landscapes, seascapes, portraits of tropical birds, and still lifes. His painting style and subject matter, while derived from the romanticism of the time, is regarded by art historians as a significant departure from that of his peers. He was first taught by his father, Paul Joosten Wouwerman, an historical painter of moderate ability. According to a contemporary account he had also studied with Frans Hals (1581/85-1666).